Haim sisters Este, Danielle and Alana have likened their meeting with Stevie Nicks to a scene in Disney classic Beauty and the Beast. The band were taken under the wing of Fleetwood Mac legend Stevie a few years ago, and she taught them how she writes lyrics on the back of journal passages. Este has recreated the songwriting style for her own musical offerings, and the three siblings still can’t get over how lucky they were to meet her. Haim recently released their second album, Something to Tell You, which reached the top 10 around the globe. It came nearly four years after their debut record, and the U.S. sisters admit they’d barely left the country before finding success with their first album, Days Are Gone. Beyonce has pledged her support to those affected by Hurricane Harvey, telling fans she's in "constant prayer" for the victims. 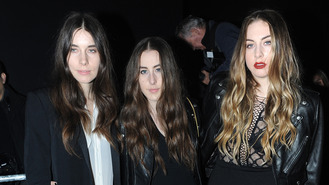 Haim sisters have likened their meeting with Stevie Nicks to a scene in Disney classic Beauty and the Beast. Beyonce's fans have criticised Taylor Swift, claiming she ripped off the singer's style in her new video. Lady Gaga has beaten her rivals to be named MTV's Hottest Summer Superstar 2017. Mel B's friends are reportedly concerned the ongoing court cases she is facing will lead her to financial ruin. Rapper Kendrick Lamar is SZA's number one fan at the MTV Video Music Awards this year. JAY-Z has opened up about how he and wife came up with such original names for their newborn twins, Rumi and Sir. Queens of the Stone Age rocker Josh Homme is the latest celebrity to sign up for CBeebies show Bedtime Stories. Mel B calls on divorce judge to keep court battle private to protect her kids. Tourmates and best pals Halsey and Charli XCX have become neighbours in the Hollywood Hills.